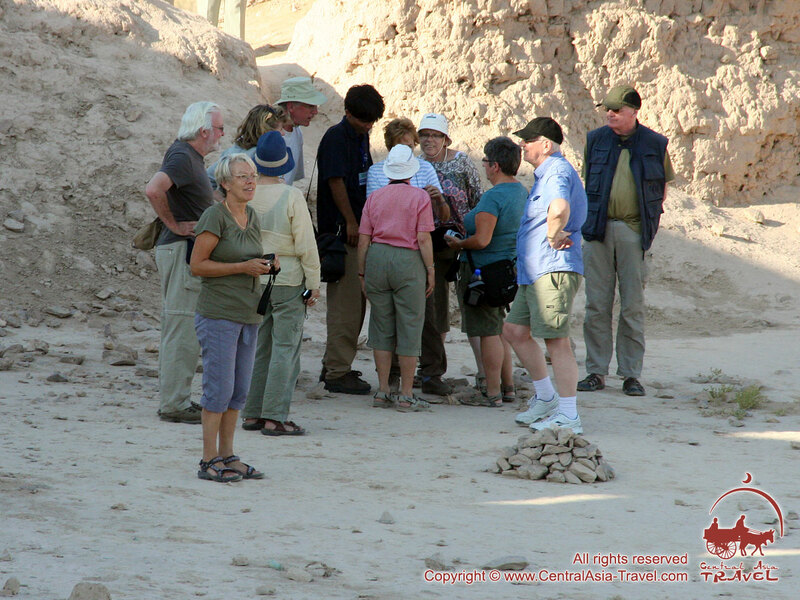 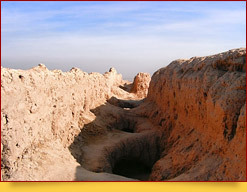 Ayaz-kala settlement (IV century B.C.) 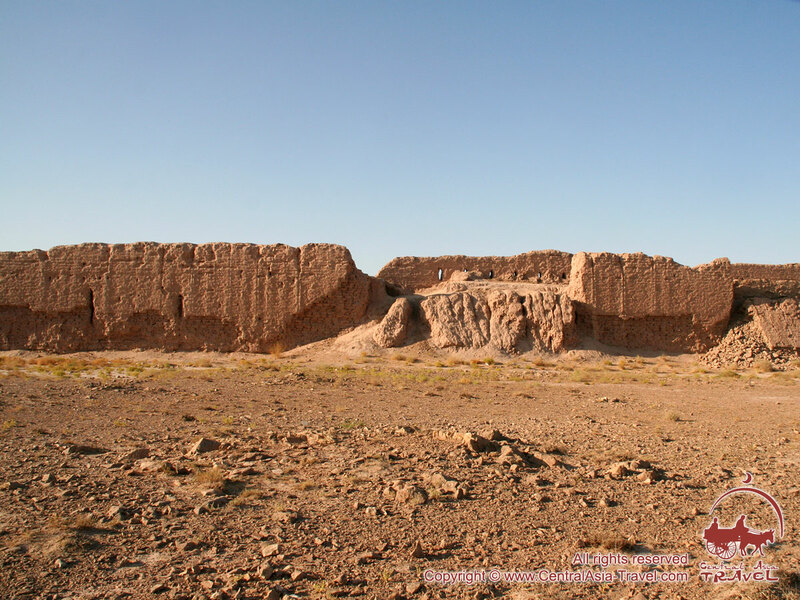 in Uzbekistan now represents a unique historical monument of Zoroastrism (Mazdaism, Zoroastrianism) times. 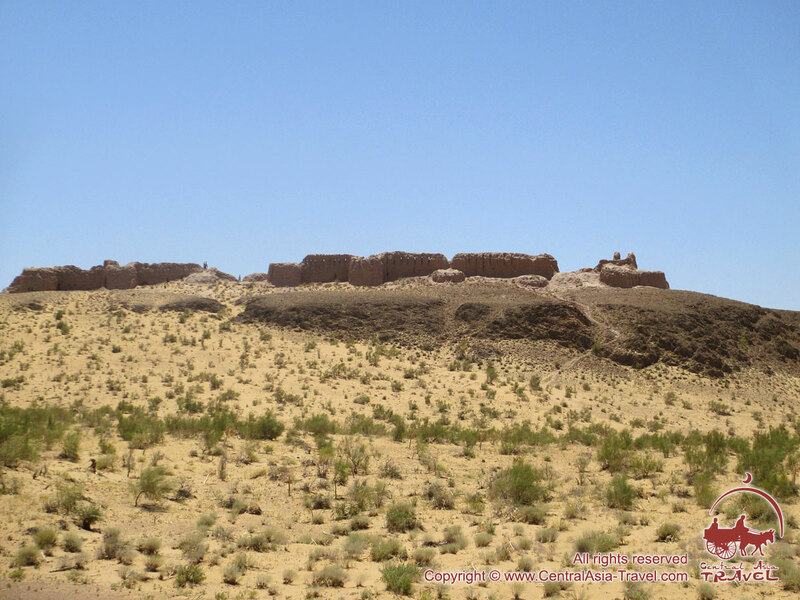 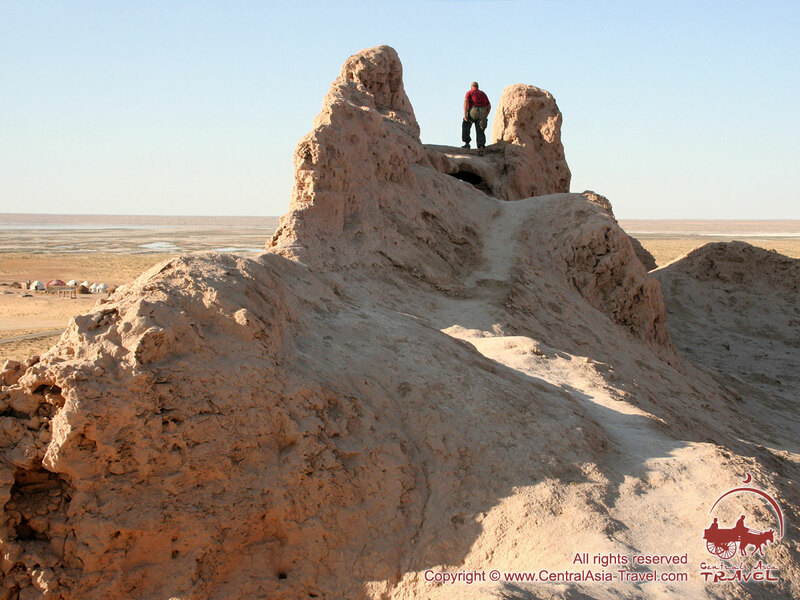 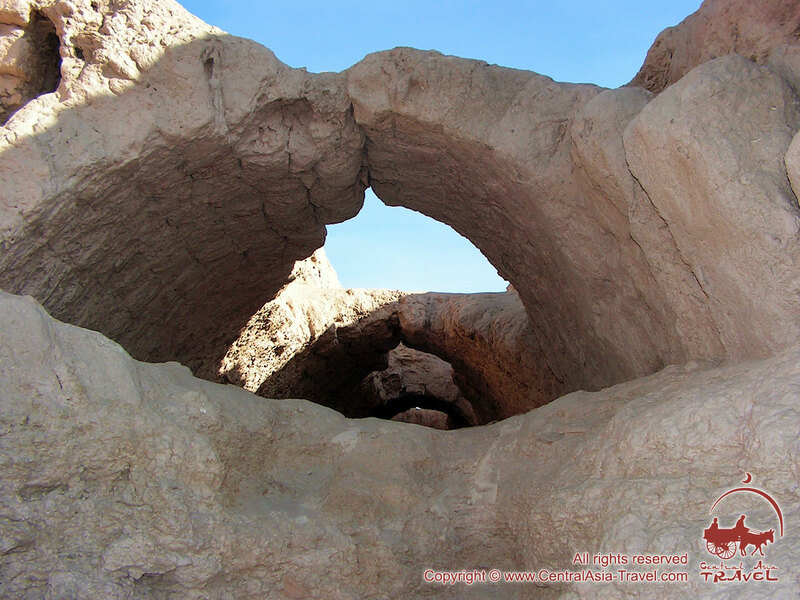 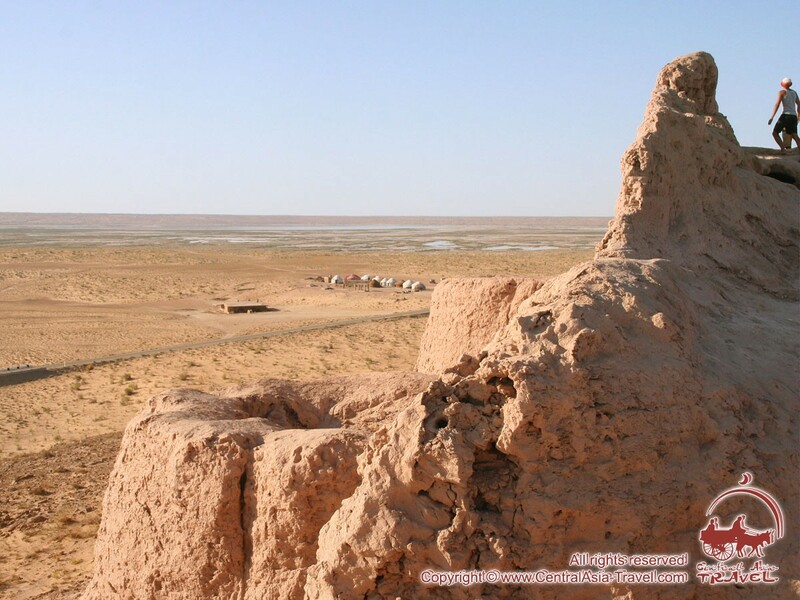 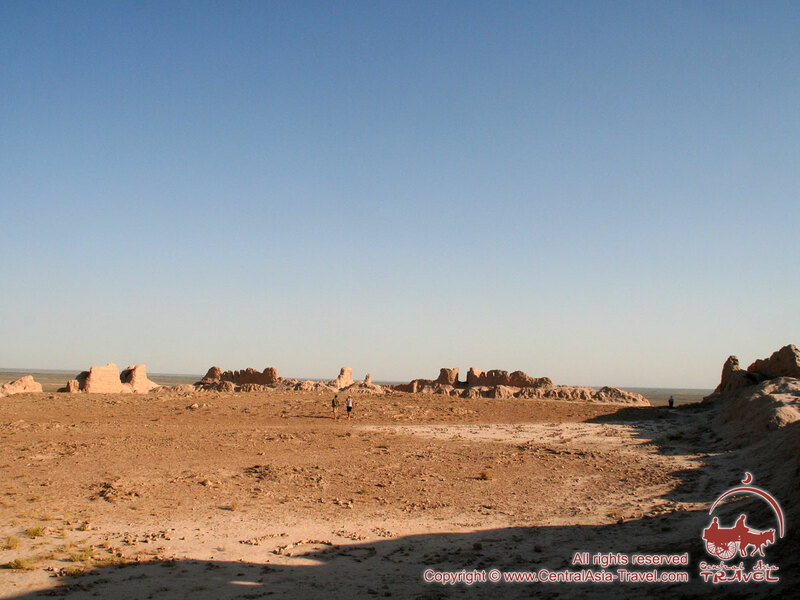 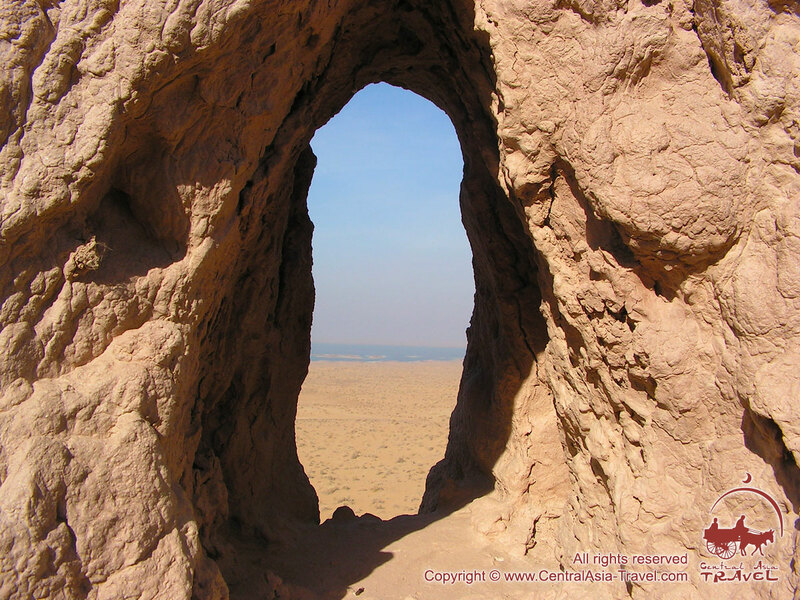 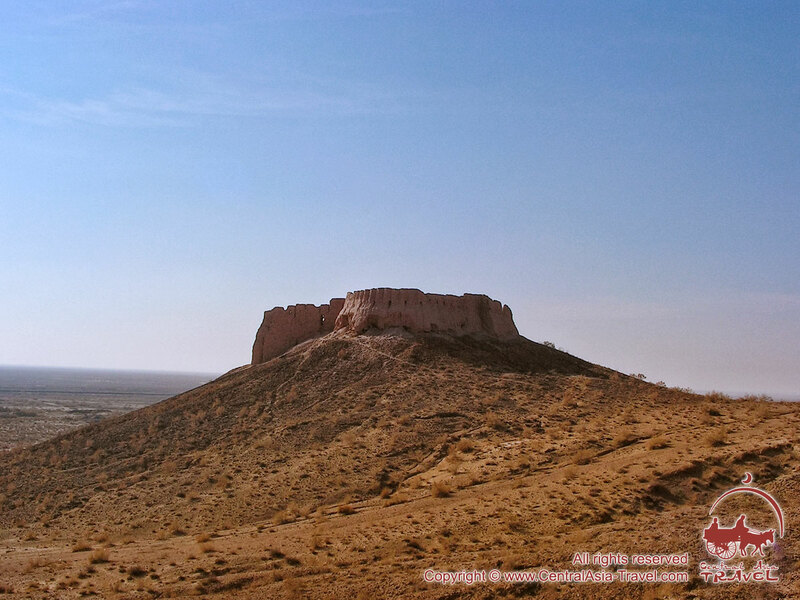 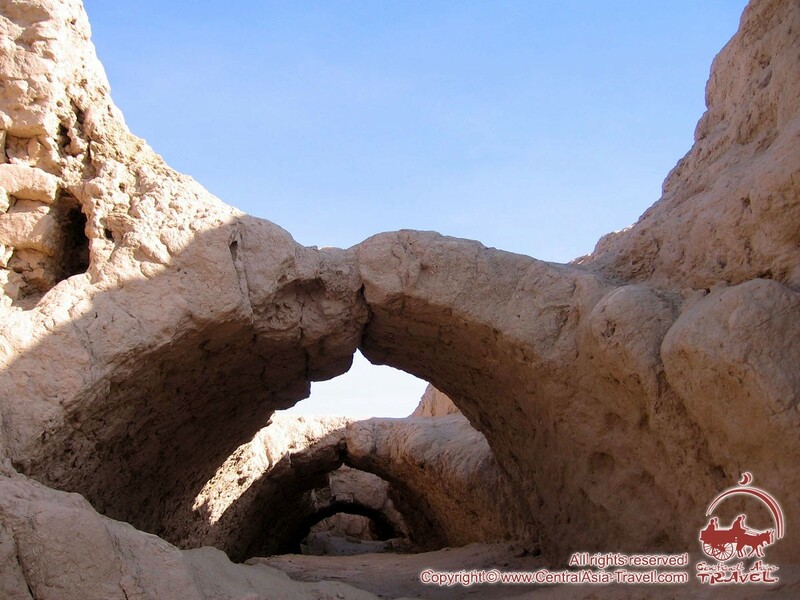 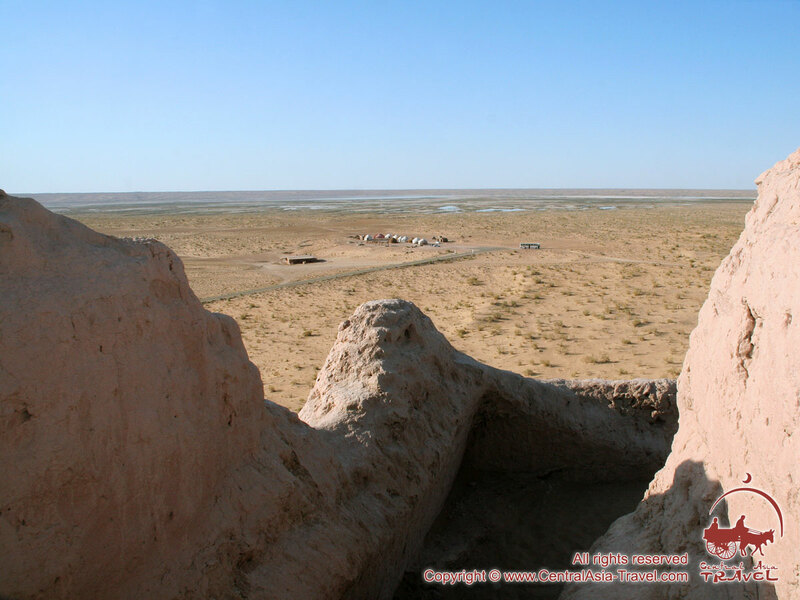 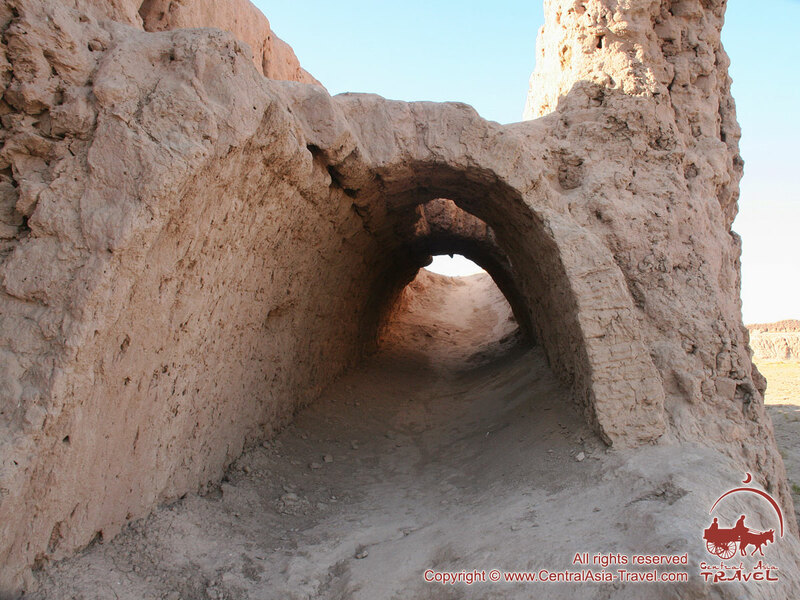 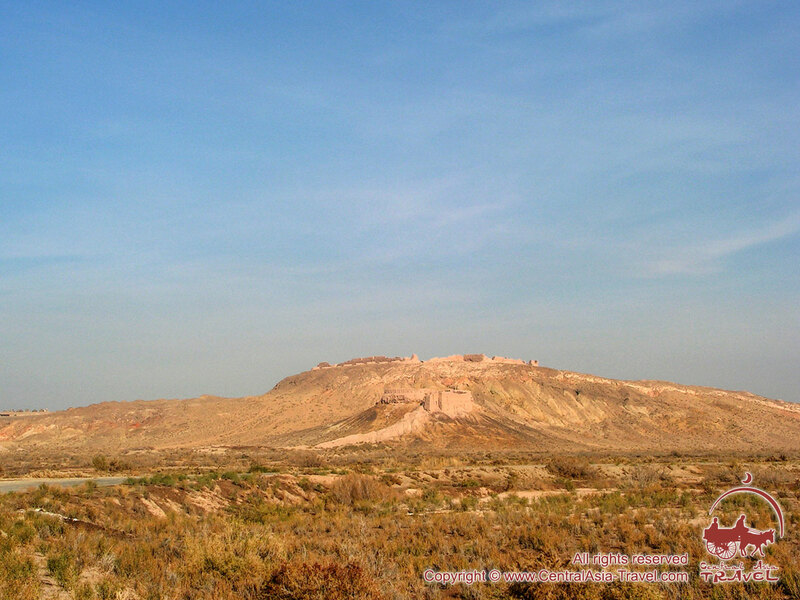 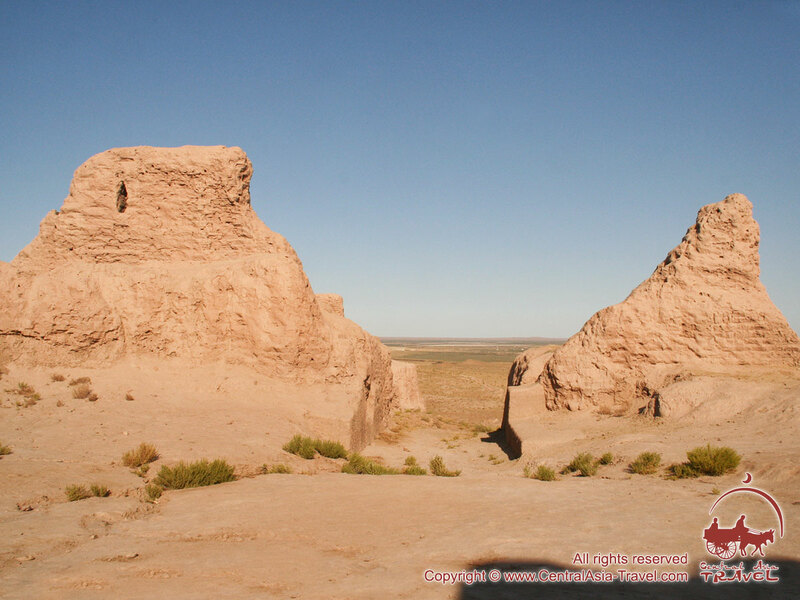 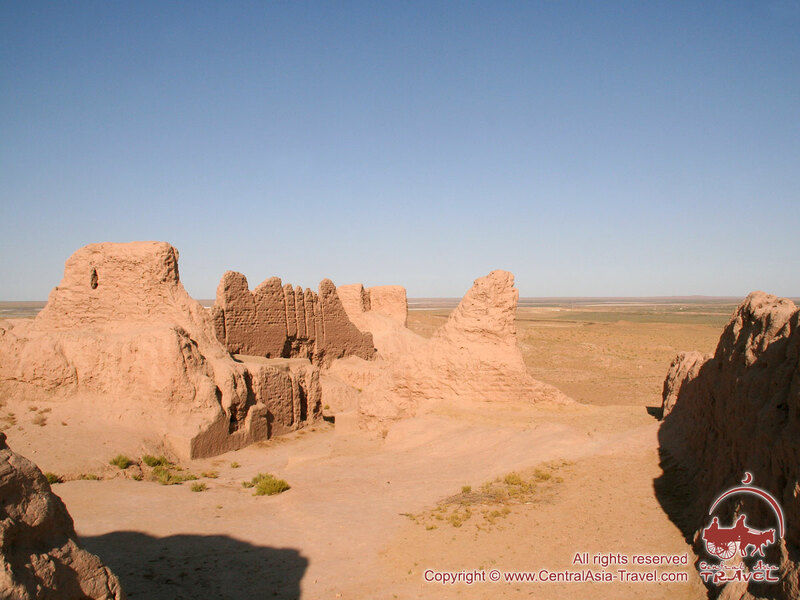 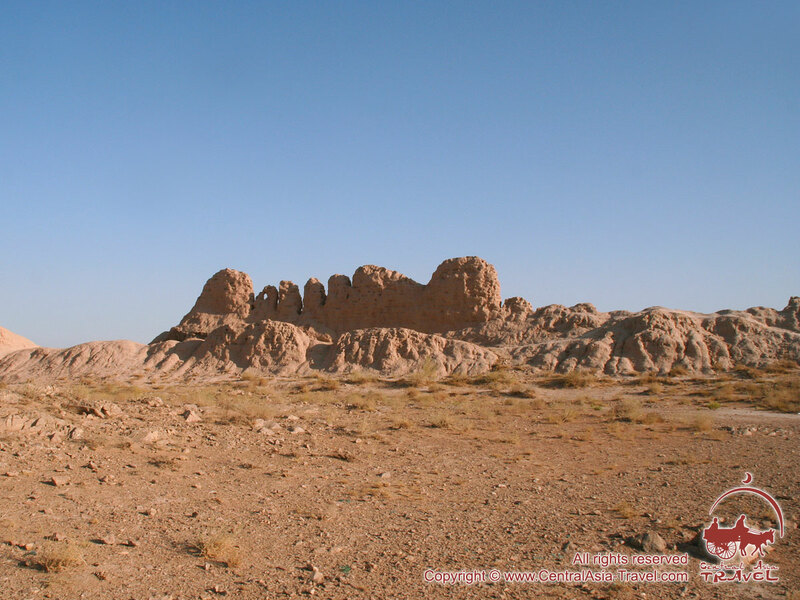 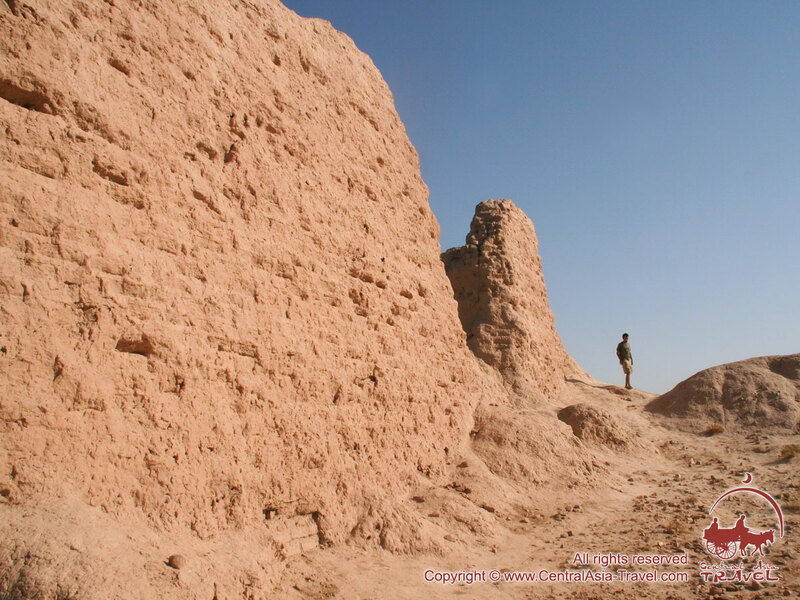 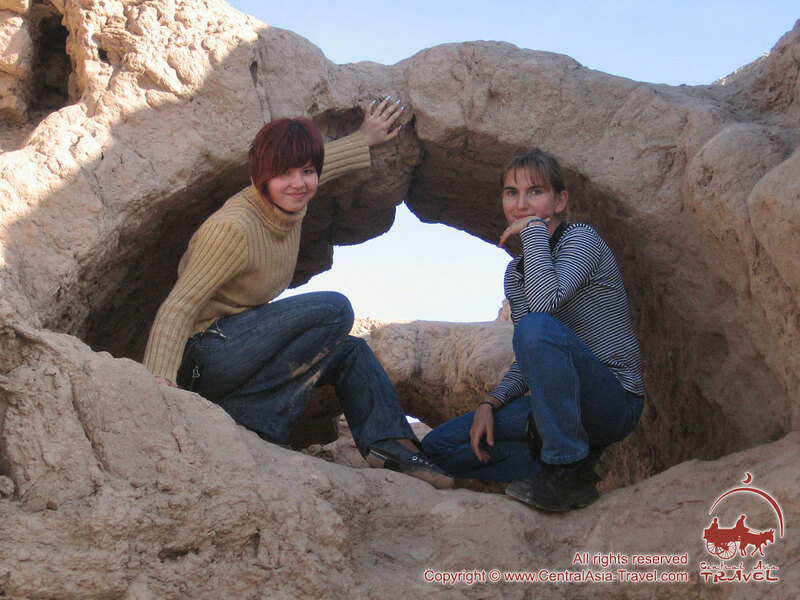 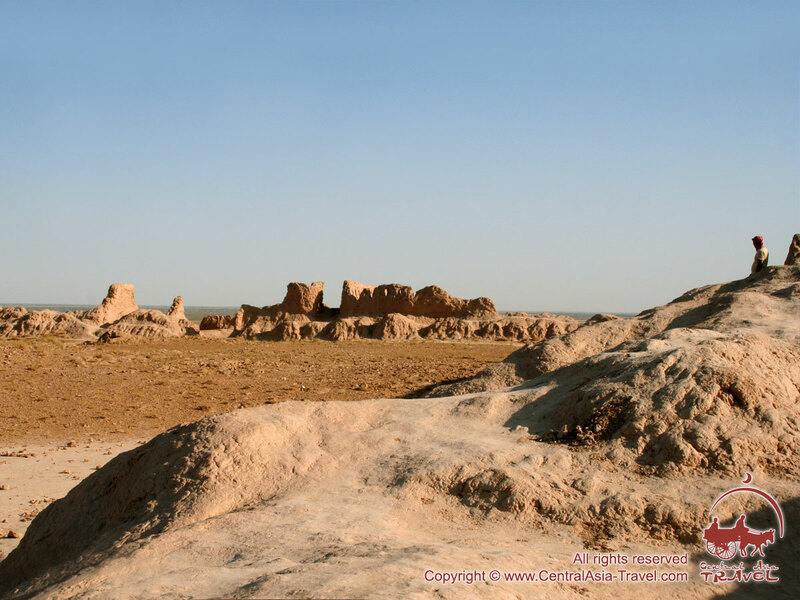 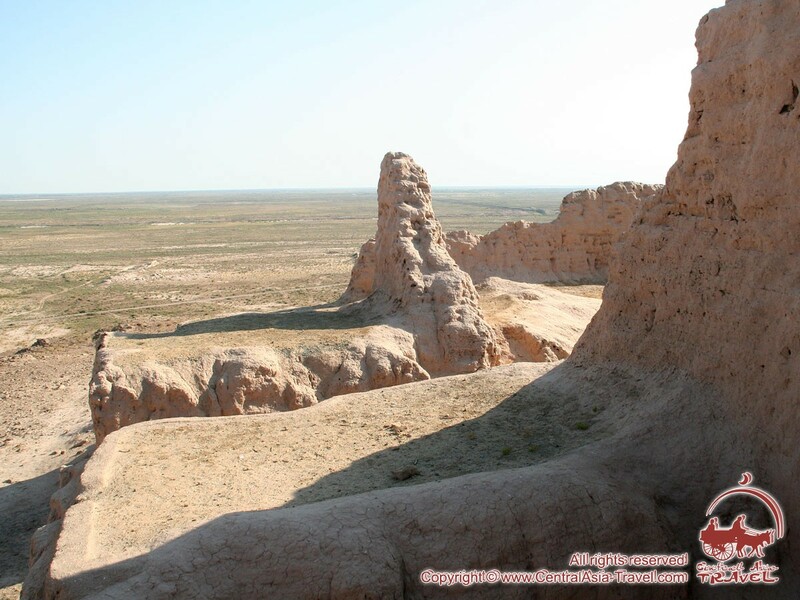 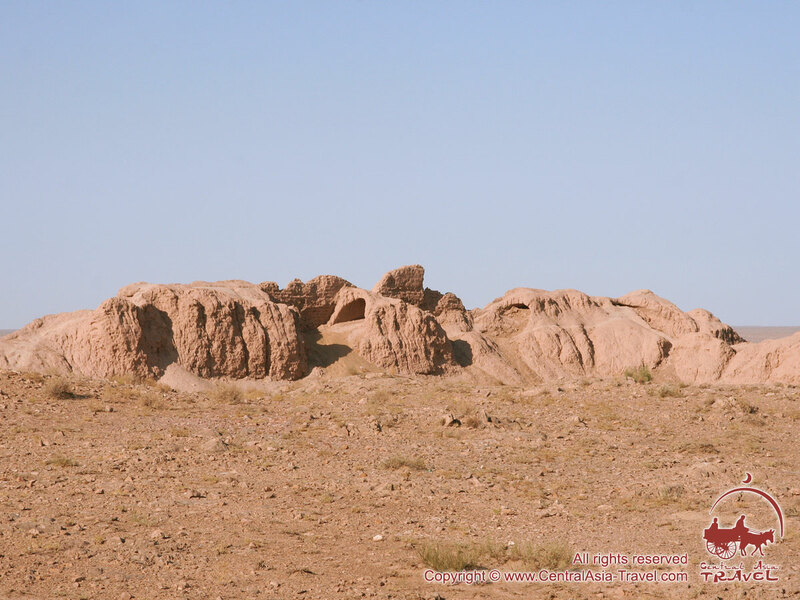 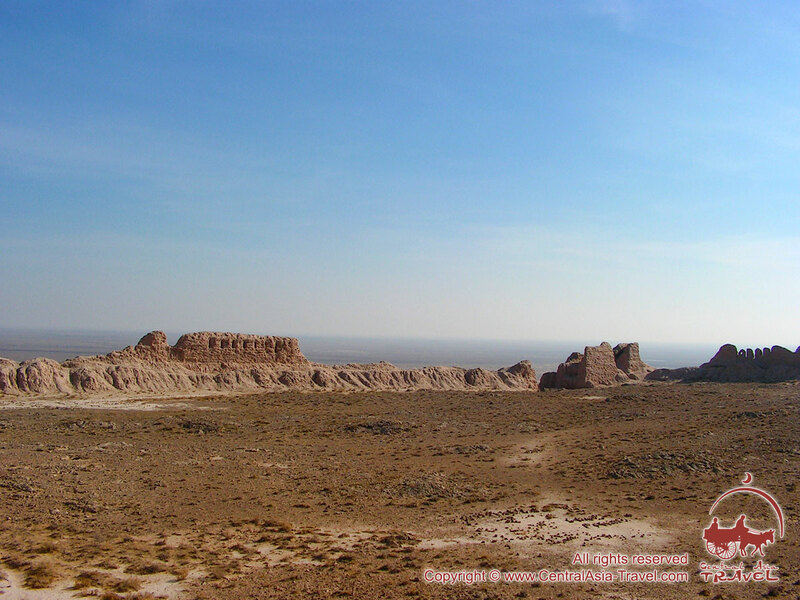 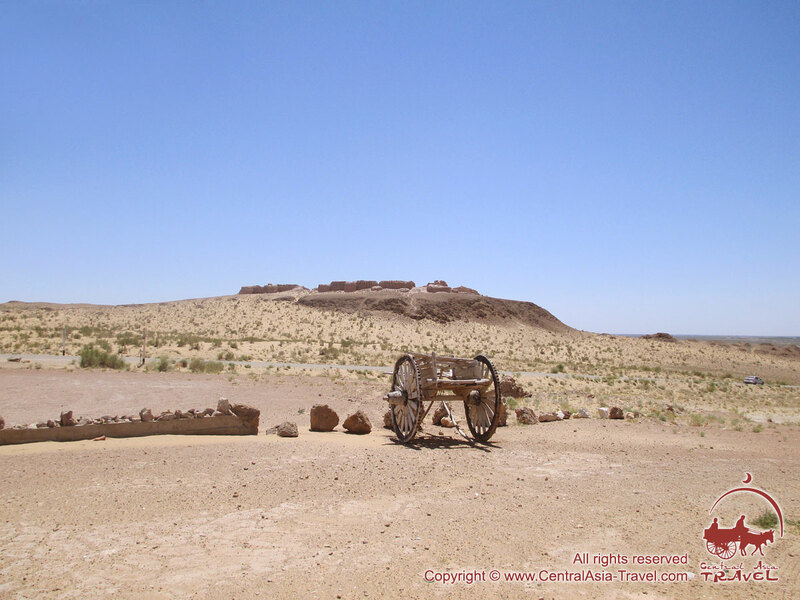 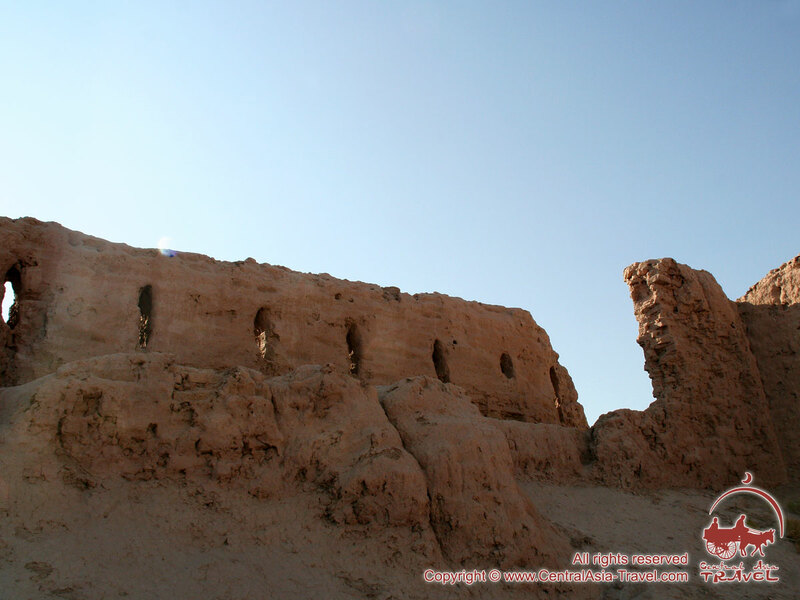 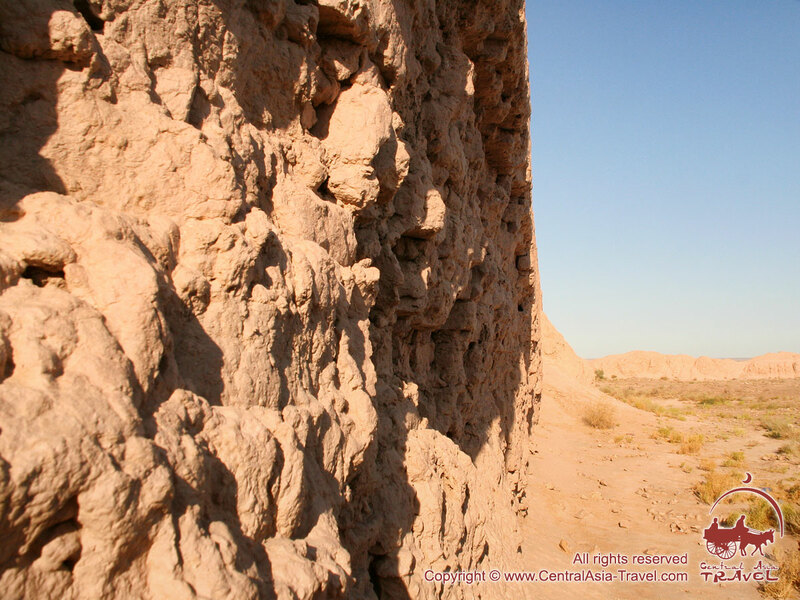 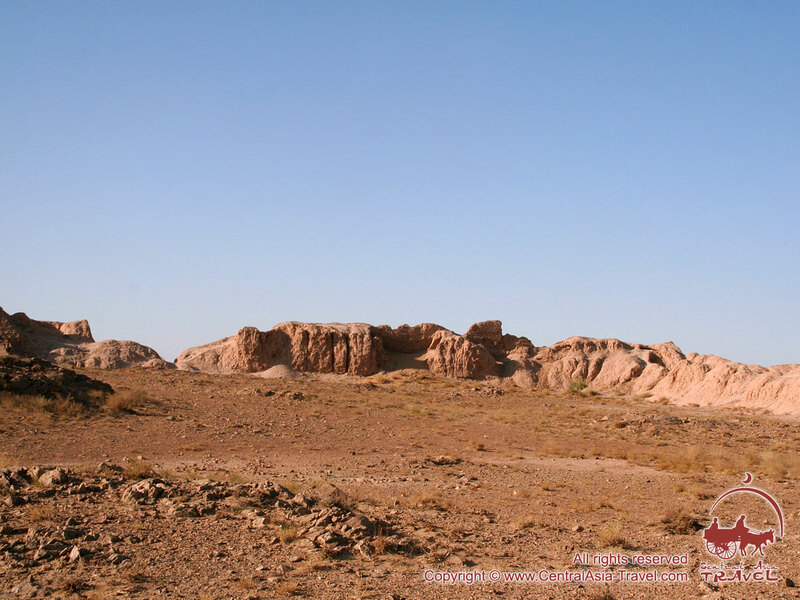 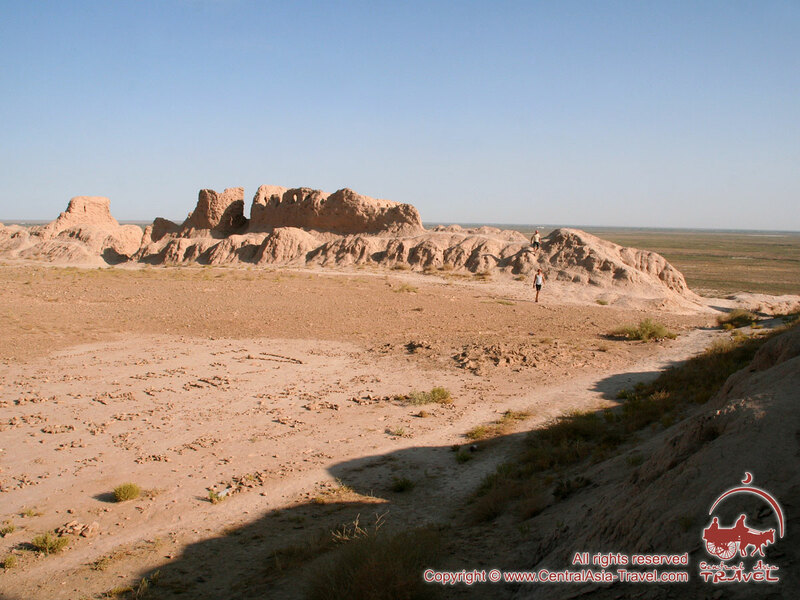 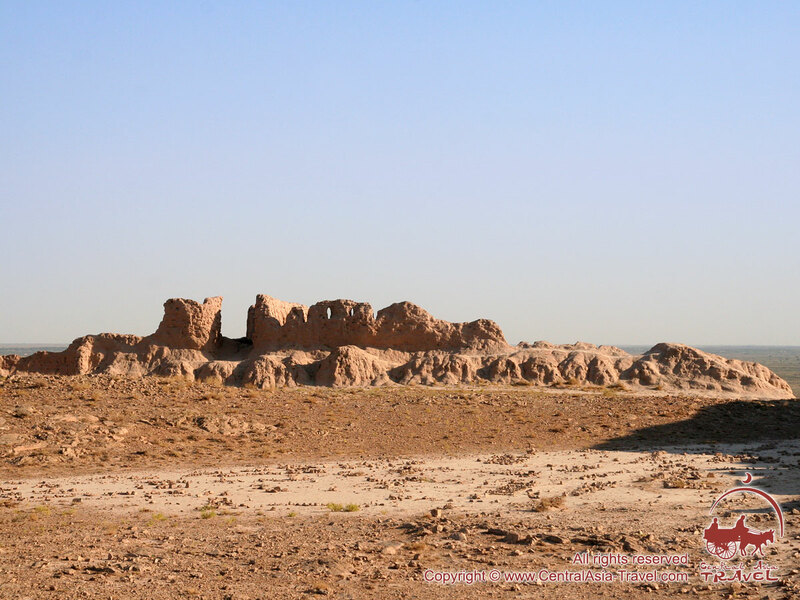 Ayaz-kala fortress is located in Ellikkalinskiy region of Karakalpakstan, in 20 kilometers to the North-East from ancient capital of Khorezm - Toprak-kala settlement, to the West from Kyrk-kyz-kala fortress, amidst the moving sends of Kyzyl-Kum (Kyzylkum desert) and Sultan Uvays mountain ridges. 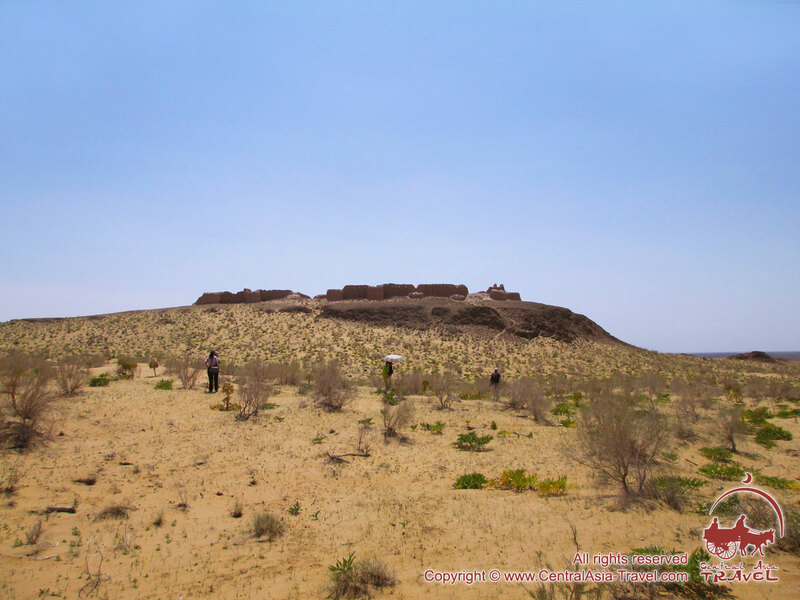 The fortification work is settled on a plane top of a hill, being 60 meters in height, which steep slopes securely protected the fortress from invasion in North, West and South. 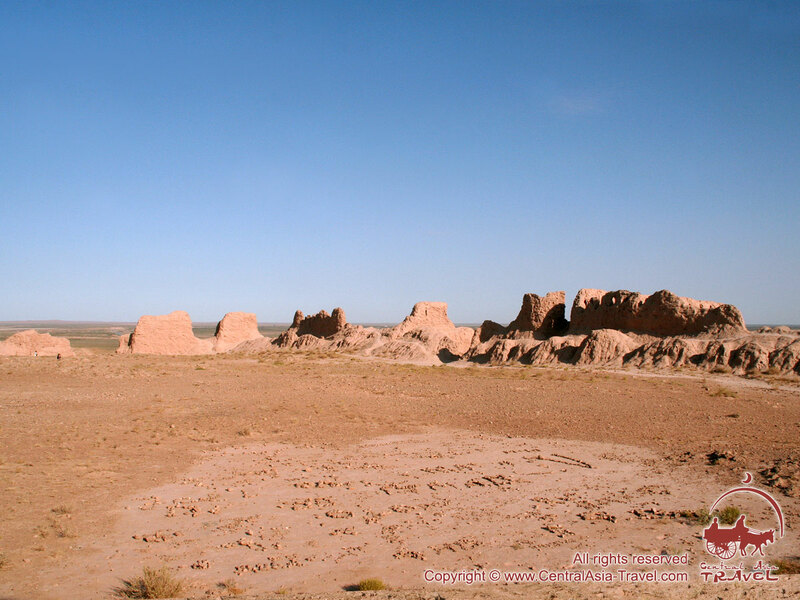 From Eastern side the fortress borders with plateau, which would be also difficult to overcome, so the enemy would be found by pointsmen quickly. 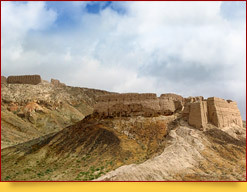 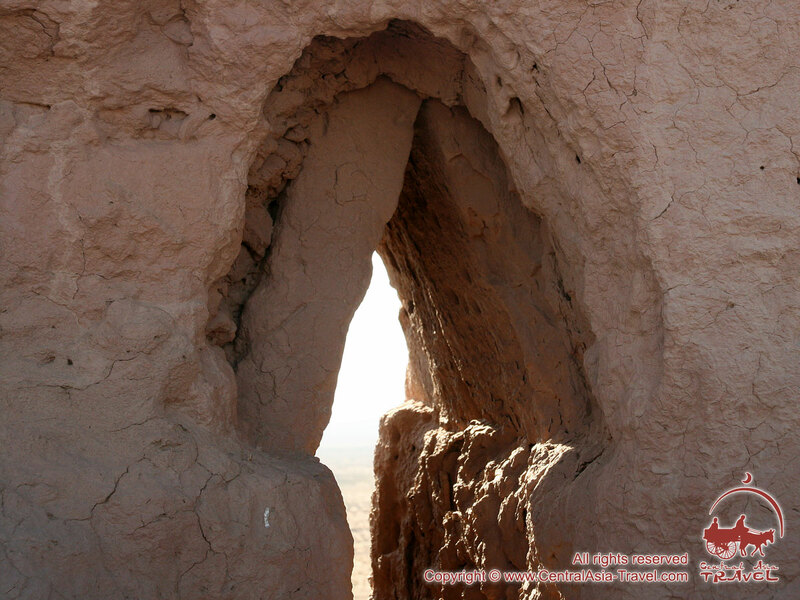 Double walls of Ayaz-kala fortress, built from sun-dried earth bricks, are turned to the four cardinal directions. 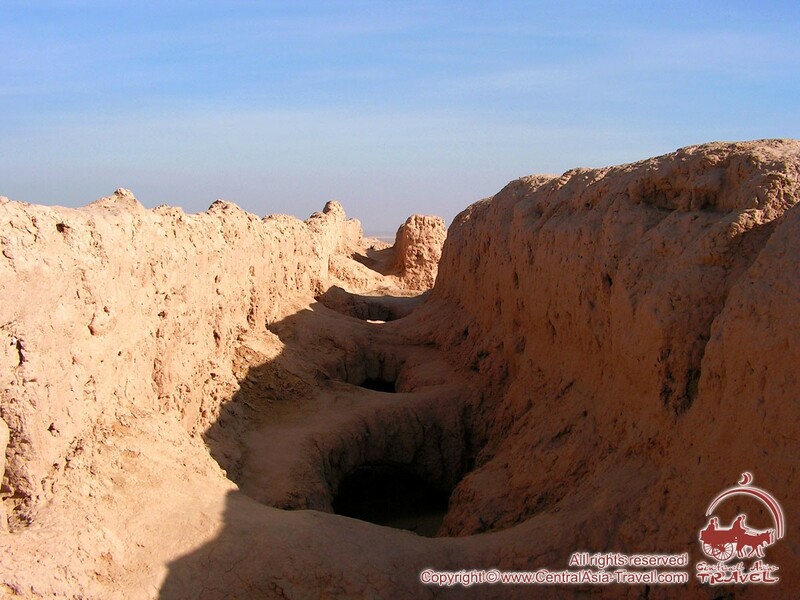 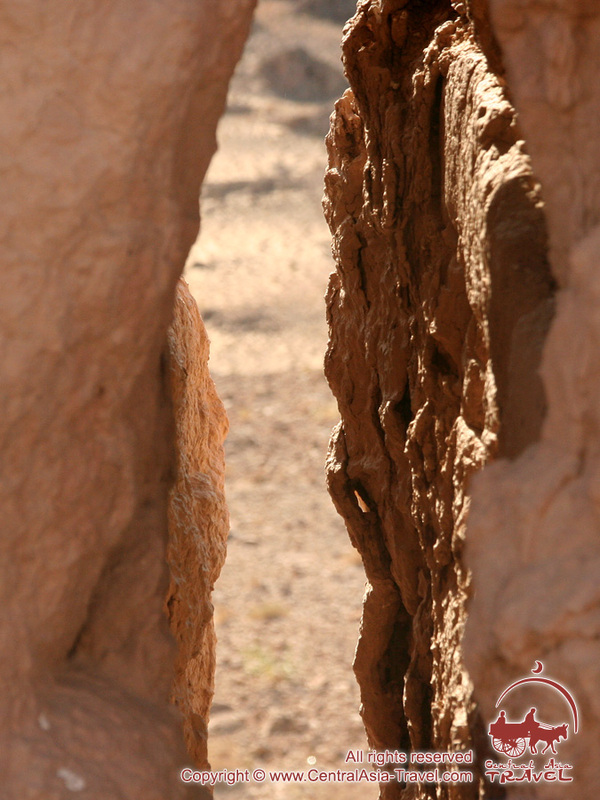 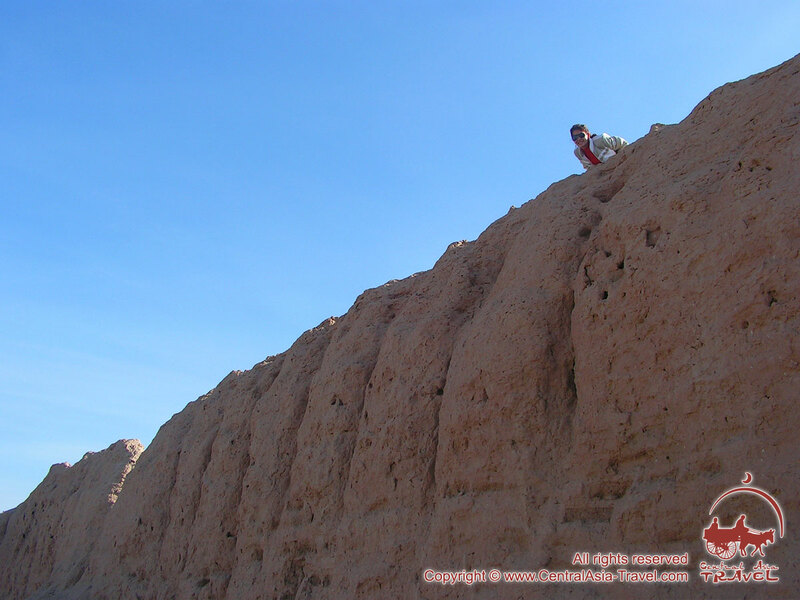 Extant outer wall is 10 meters in height, and its thickness is about 2,5 meters, inner wall has a bit smaller size. 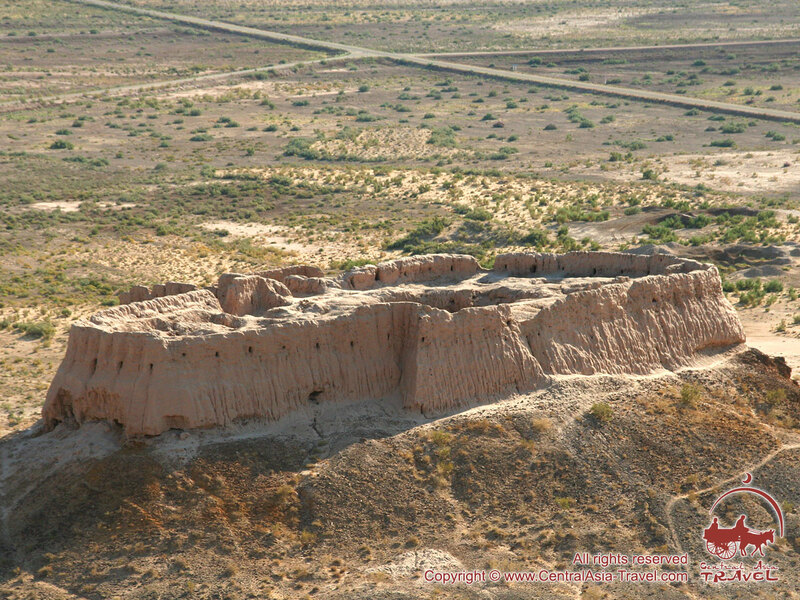 Walls’ fortifying was performed for account of semicircular towers, built in 11-13 meters from each other. 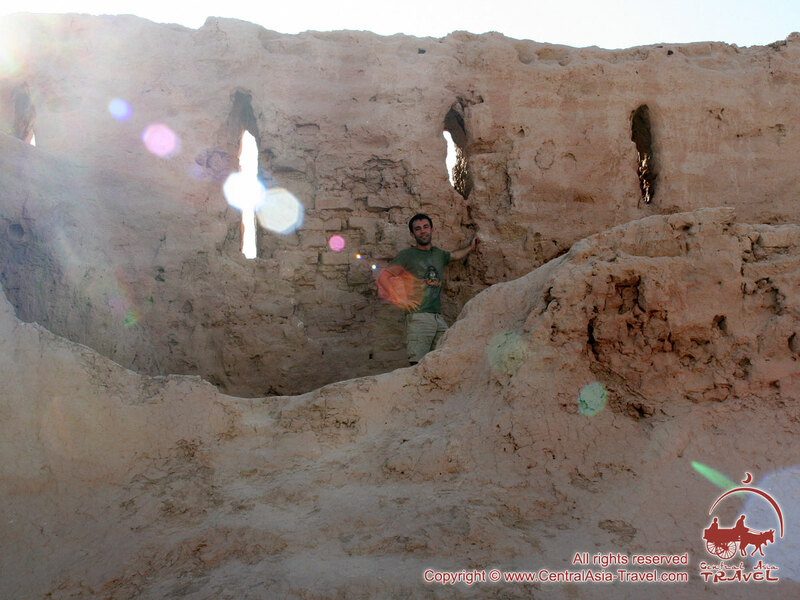 All the towers are equipped with inner space, intended, most likely, for warriors rest or for the guard. 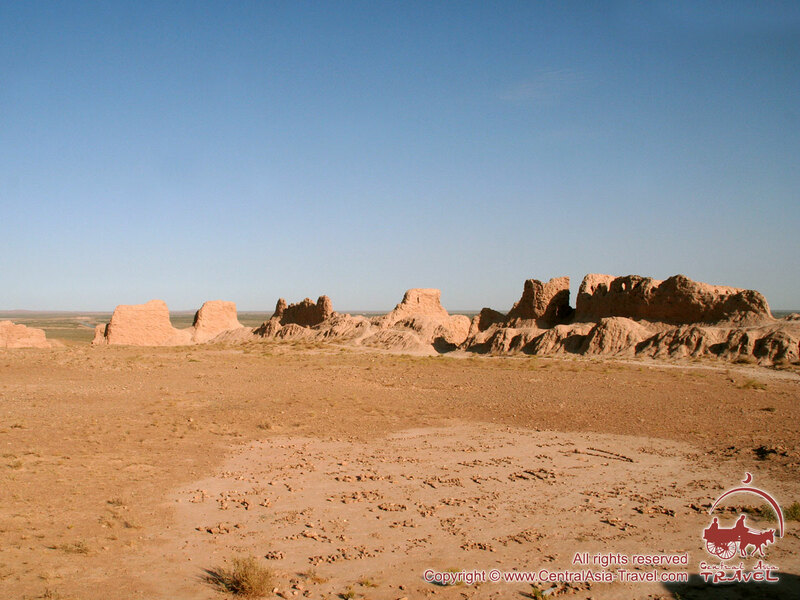 Entrance into the fortress, located on Southern side is protected by insidious labyrinth. 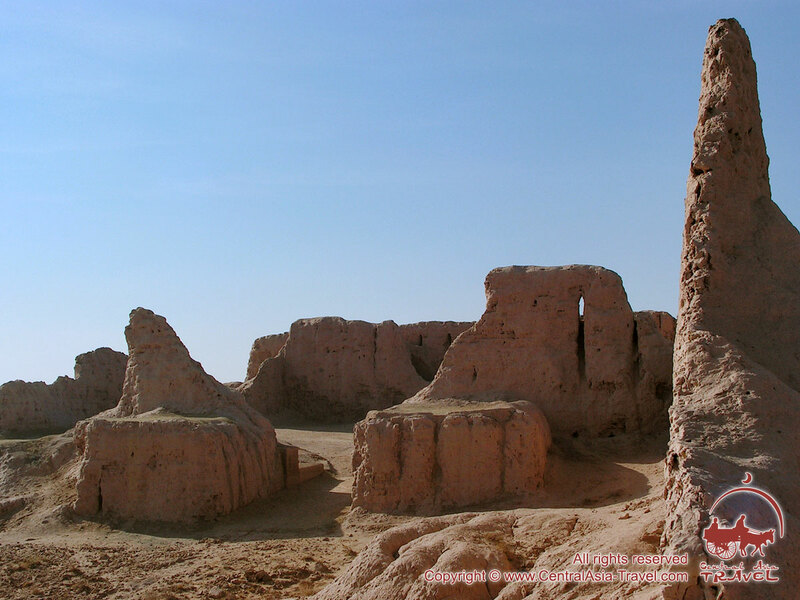 The entrance was constructed in such a way, so that the Southern wind, ruling over these places, could take garbage and dust out of the city. 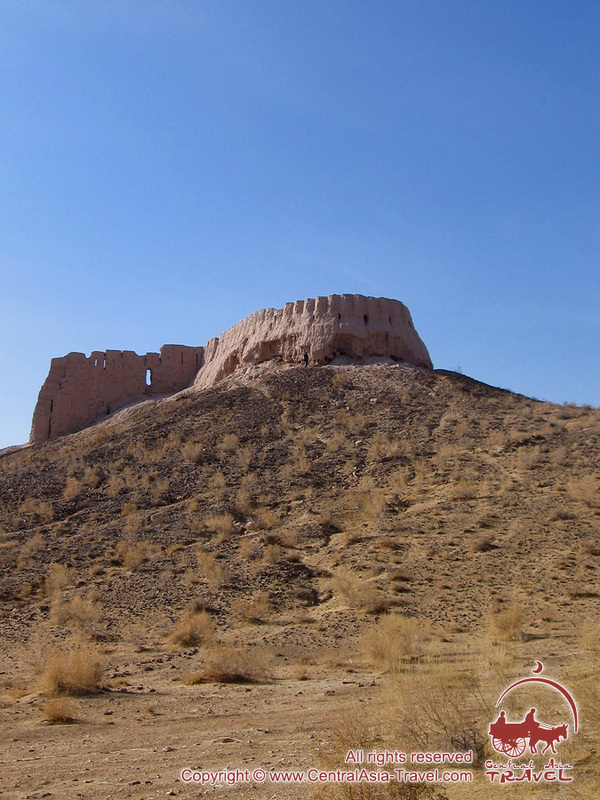 Due to this fact the fortress obtained its name “Ayaz-kala”, what means “Fortress in the wind”. 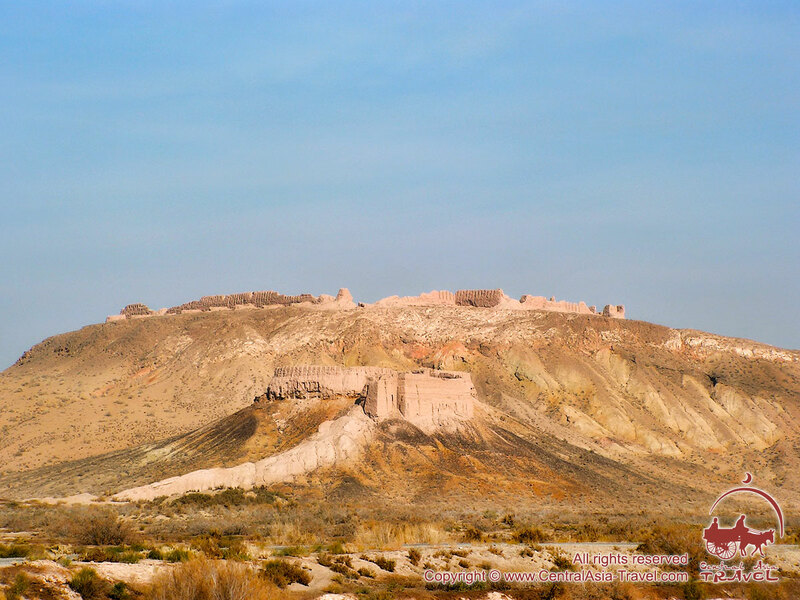 “Folk tale connects this fortress with the name of a hero - slave, named Ayaz, who intended to seek a princess’s hand in marriage, living in Kyrk-kyz fortress with her 40 female friends. 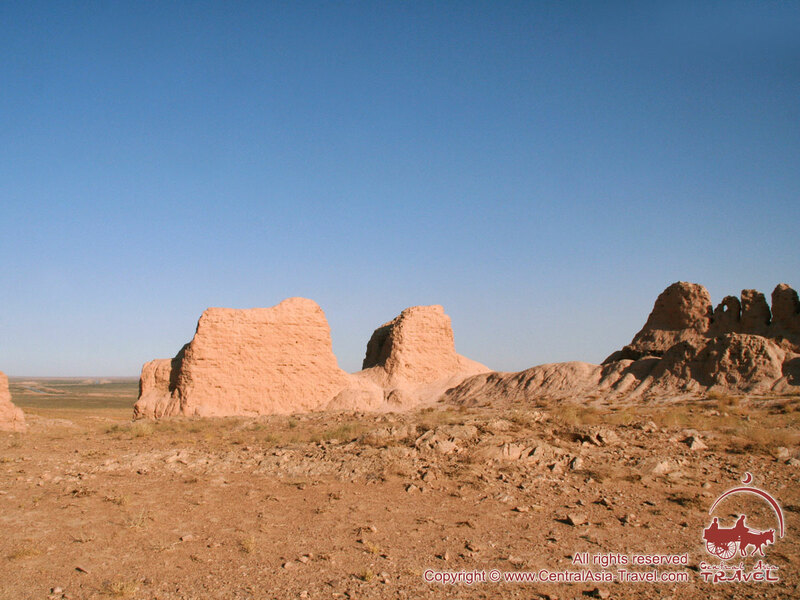 The image of brave and wise slave-knight Ayaz is one of the ancient images of Central Asian Turkic folklore. 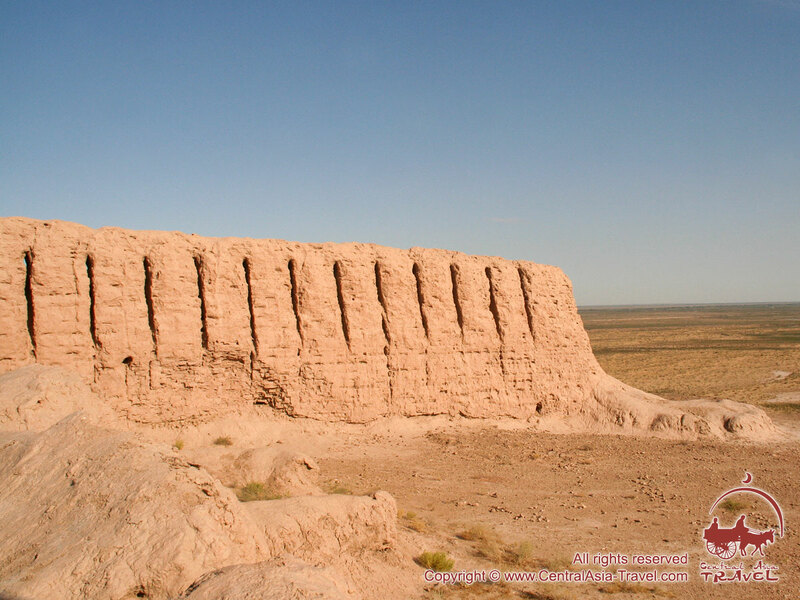 Kazakh tale describes legendary events, which predetermined foundation of the Aral Sea, disappearance of Ustyurt riverbed of Amu Darya and emergence of ancient Khorezm. 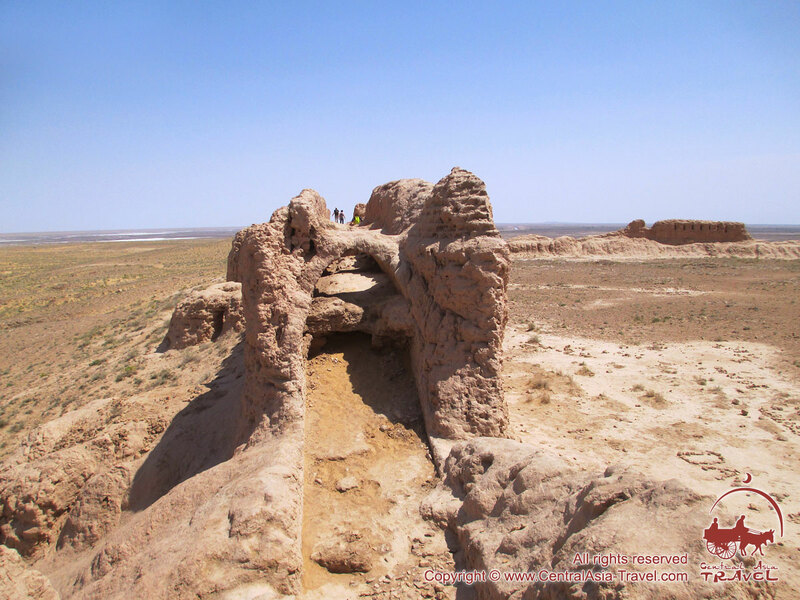 According to this legend, there was no Aral Sea in old times, and Syr Darya and Amu Darya, joining, were flowing via Lauzan, Kunya-Urgench and Aybugir into the Caspian Sea. 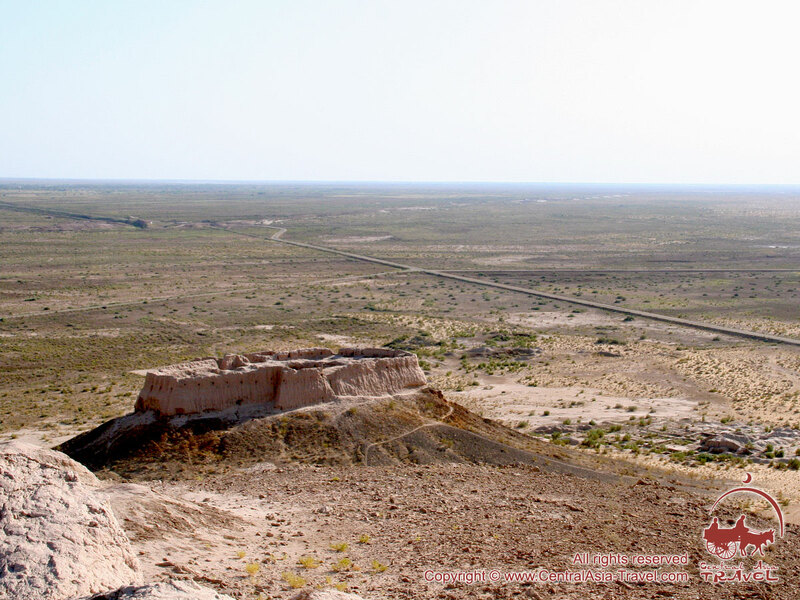 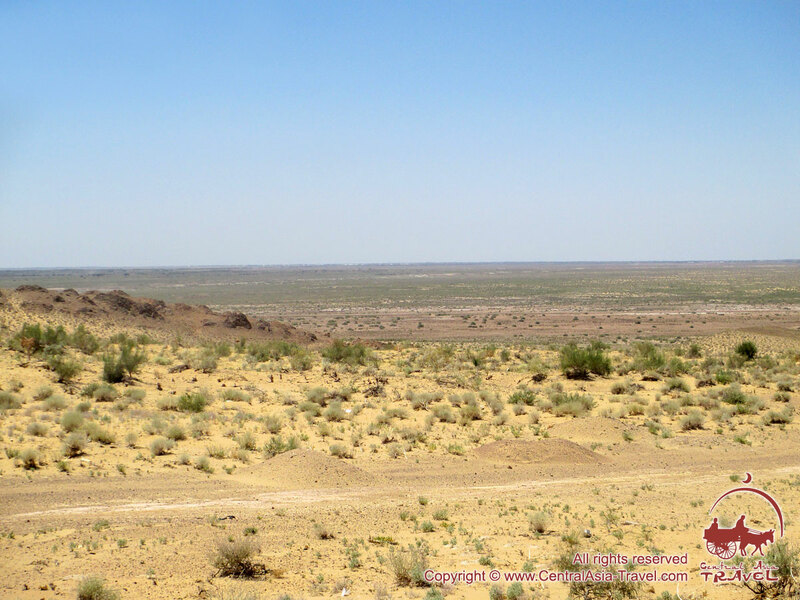 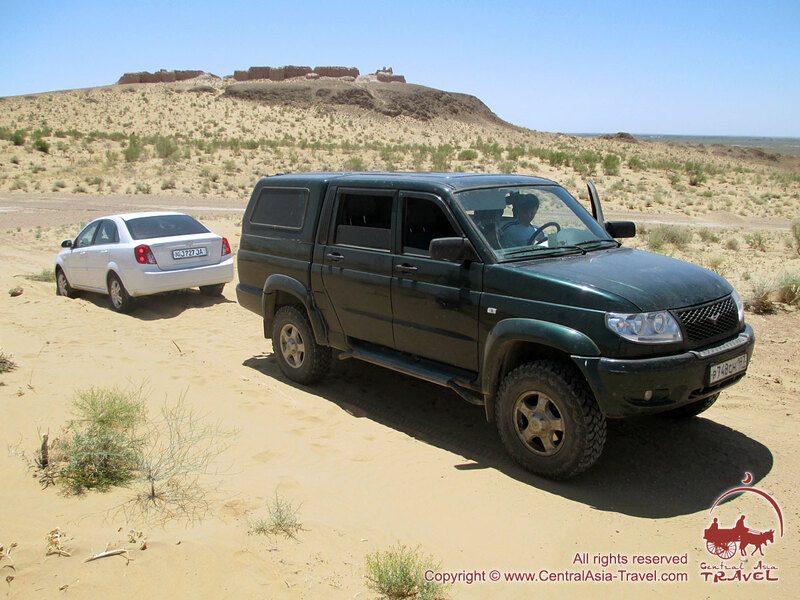 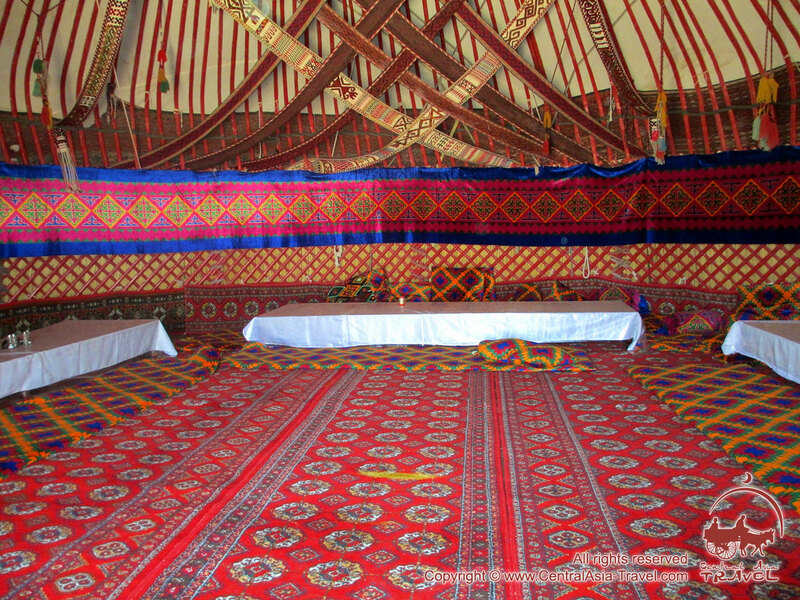 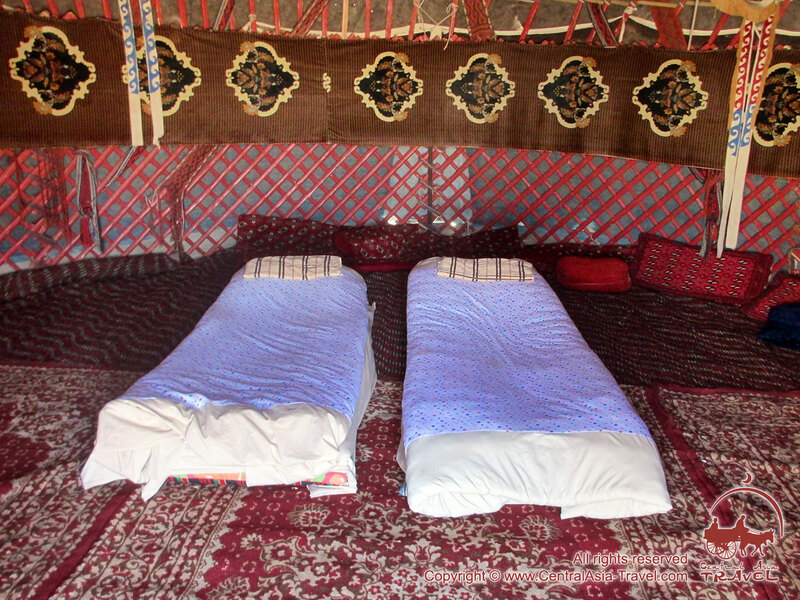 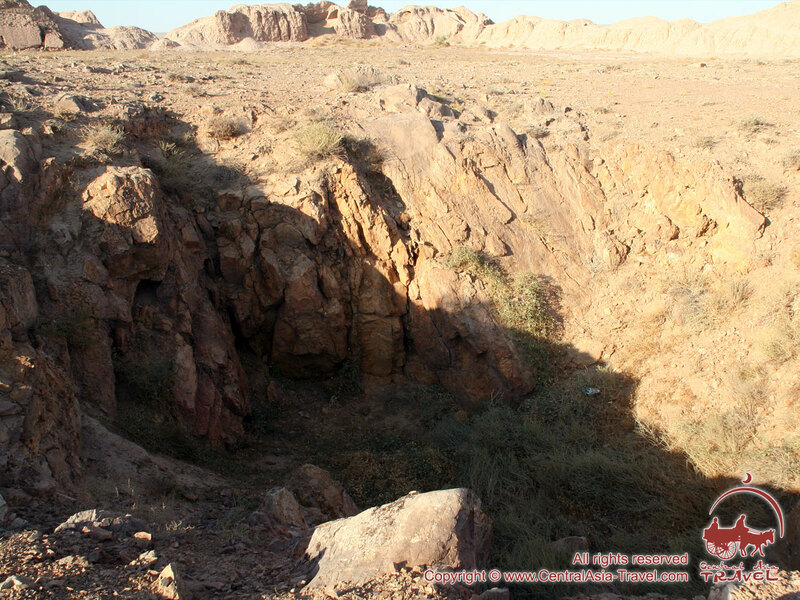 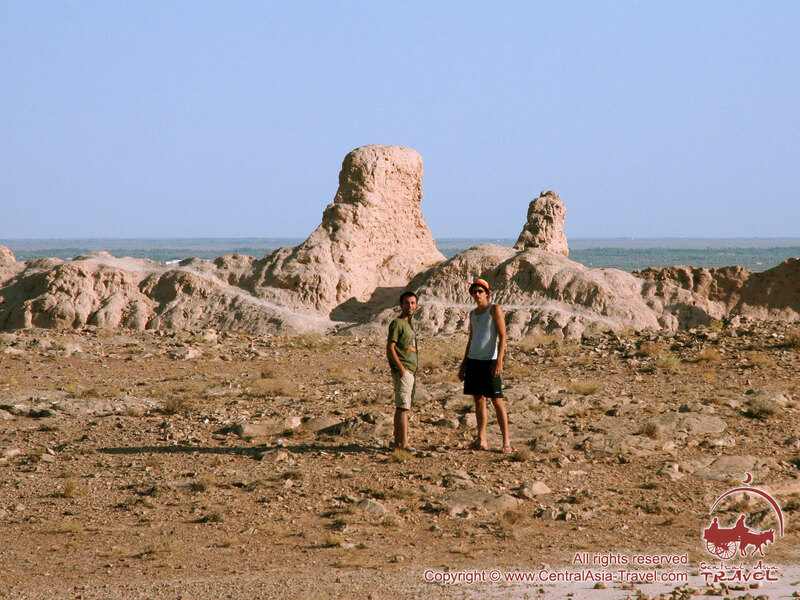 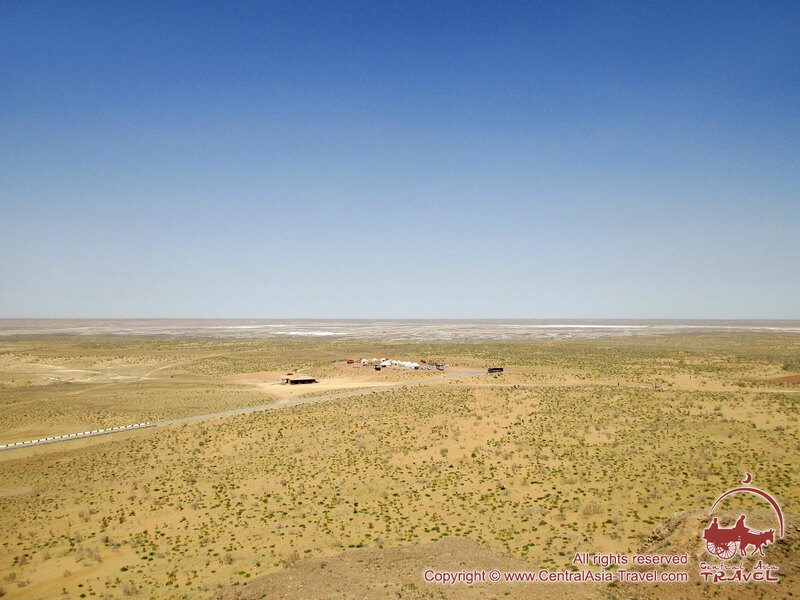 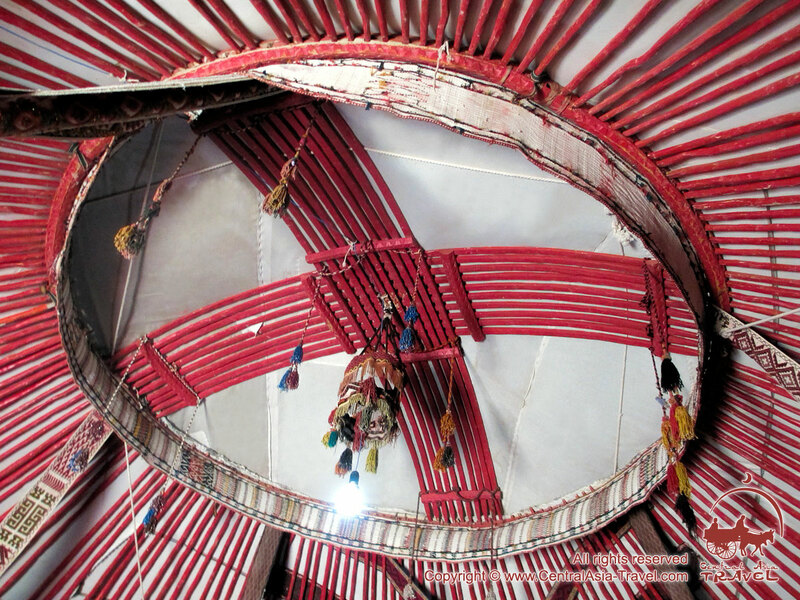 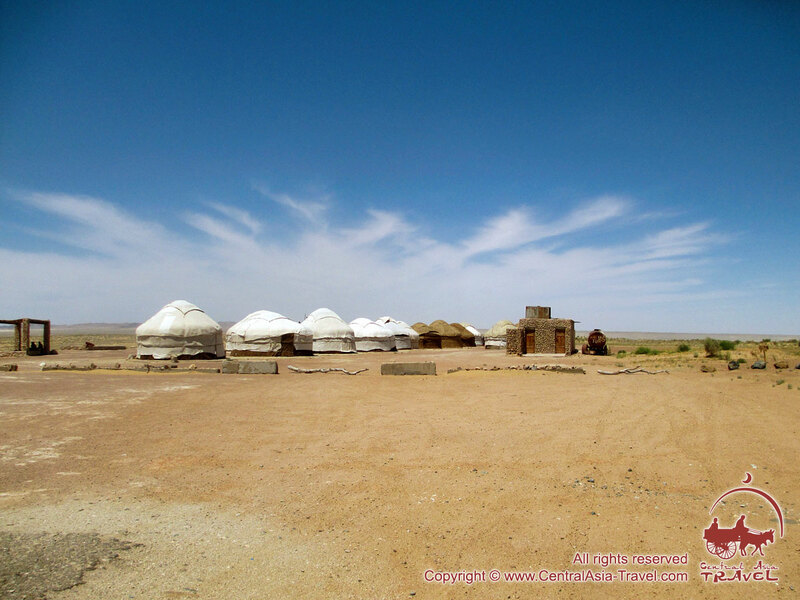 On the place, where now the Aral Sea is located, there lived “adagy” people, ruled by a cruel and perfidious Fasyl-khan, and on the territory along Uzboy, “baysyn” people was settled, whose ruler was Ayaz-khan, a former slave, who managed to become a governor of the state thanks to his wisdom and fairness. 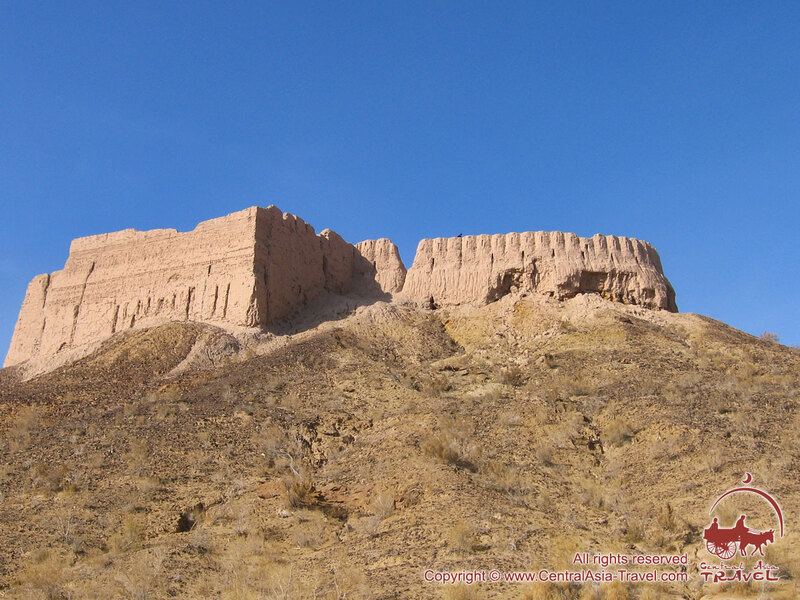 In the beginning of new era the residents of Ayaz-kala tried to build new defensive constructions inside the fortress, however this building was destined to remain unfinished. 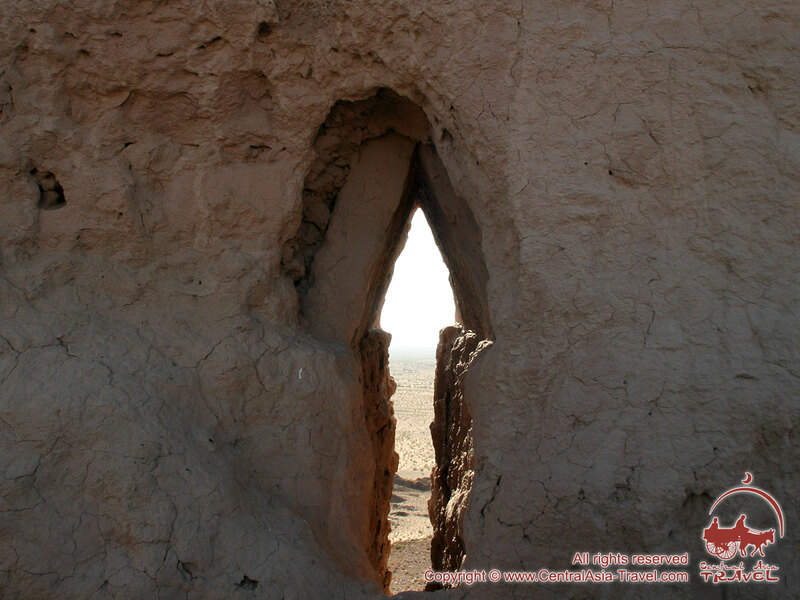 Up till now scientists guess, what could make builders and common citizens to leave Ayaz-kala. 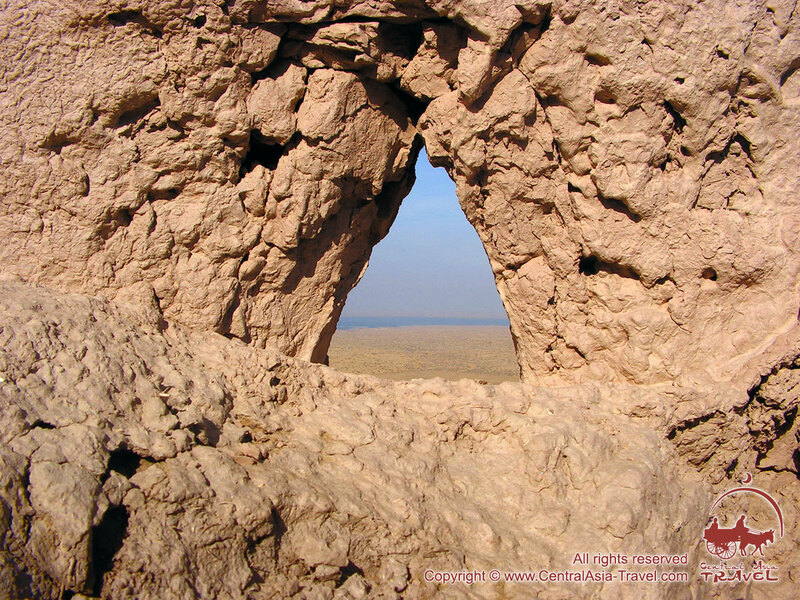 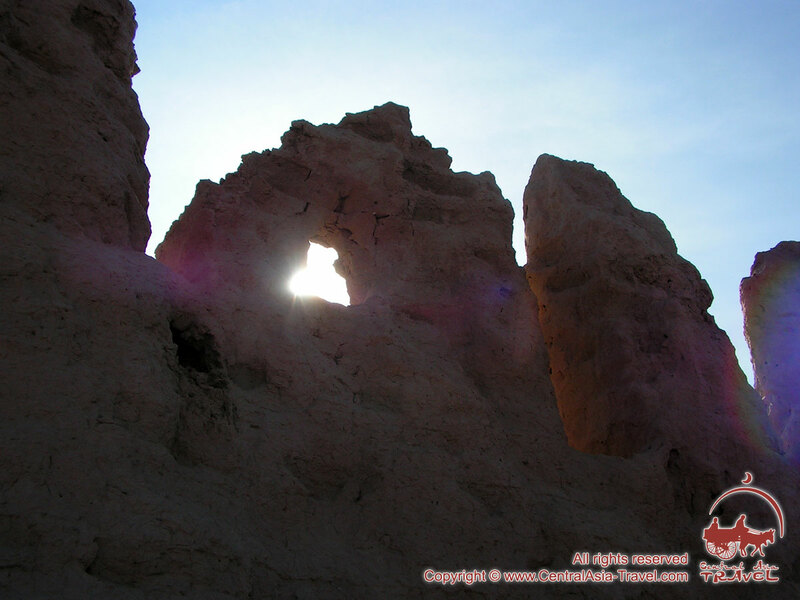 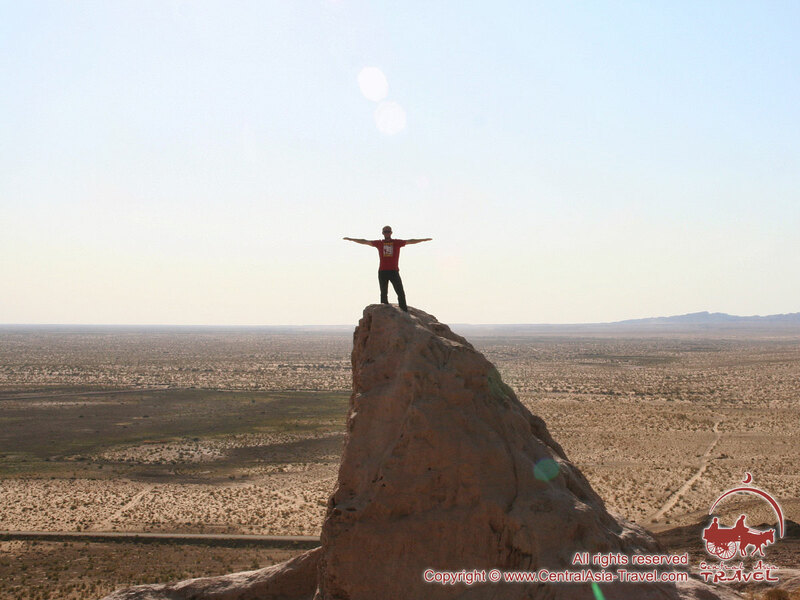 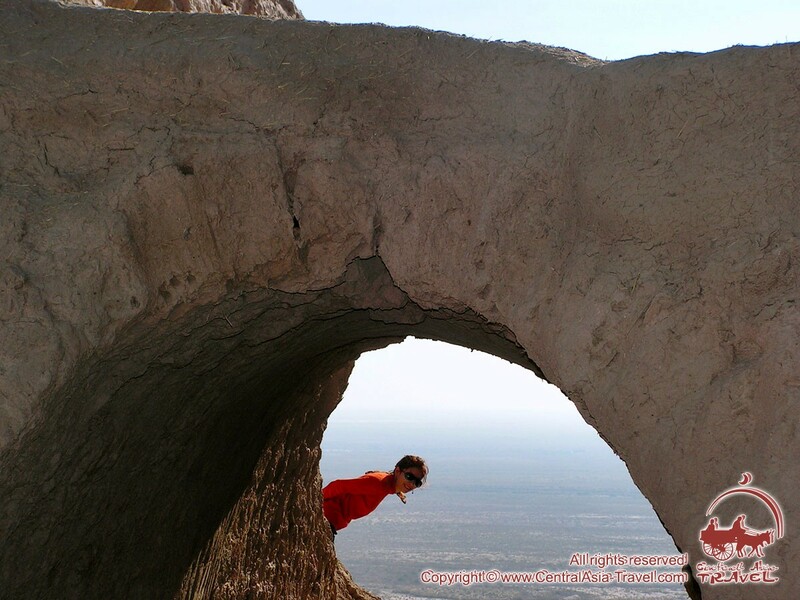 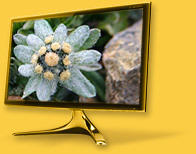 From the upper point of Ayaz-kala it is possible to see a lake, which is called Ayazkol. 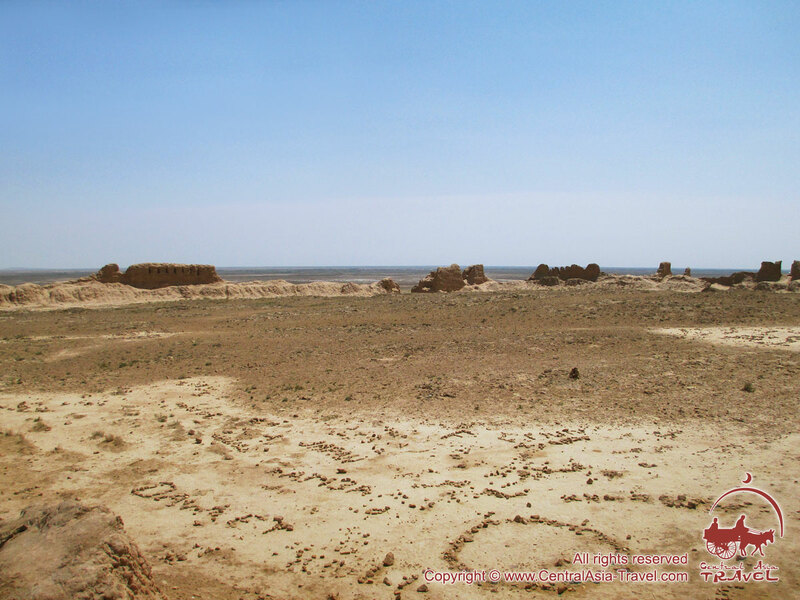 Water in this lake is so salty, that even in summer there appears a feeling, that the lake is under a thick layer of ice.